Come in and try any of our tempting chocolate offerings or try one of our three signature specialties - choose from our 14 Layer Cinnamon Torte - 14 layers of delectable cinnamon with an exquisite chocolate filling piled with chocolate curls on top; our rich Bavarian cake - a chocolate cake made with a Bavarian fruit filling and finished with a chocolate drizzle or our Chocolate Ganache filled and topped in rich chocolate. Relax with our in-house roasted coffees and espressos or enjoy café mocha, hot chocolate or chocolate chia tea along with chocolate scones, muffins and tri-level brownies. Also serving breakfast quiches and daily lunch specials. Full catering & wedding cake services available. Like and follow us on Facebook for hours events and promotions, click on name above for more details! A dream come true for the popcorn and chocolate enthusiast. 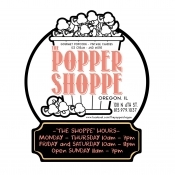 Blarney Stone Popcorn features over 20 flavors of popcorn. The chocolate lover will savor the Turtle (pictured), Chocolate Caramel Delight and Chocolate Macadamia Nut flavors. Dip & bread mixes, pastas, dressings, BBQ rubs & sauces, flavored coffees, caramels and other chocolate treats, as well as a great selection of gifts can be found throughout our unique store. Click on the name above fo rmore details. Like us on Facebook and follow us on Instagram! Enjoy a relaxed casual atmosphere and eat in or takeout breakfast, specialty coffees, pastries & baked goods and of course all come in chocolate flavors. 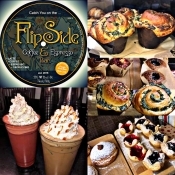 Like & follow Flip Side on Facebook for hours, events and promotions! Full service retail or wholesale bakery. We're the #1 in the Sterling-Rock Falls area! Family owned & operated since 1942. Click name for more details, scroll to bottom of listing for our Facebook and website info! 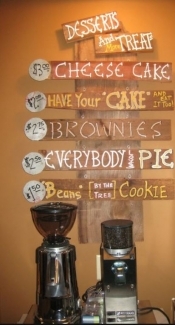 Krumpets Bakery & Cafe creates one of a kind decadent pastries, bars, cookies, pies, cakes, and daily treat specials. The favorite of these consist of chocolate. Whether you prefer dark, milk, bittersweet, or cocoa your craving will be met. All of these desserts tantalize the pallet and satisfy your sweet tooth. Since every recipe is made from scratch at Krumpets those who need a gluten free option won't be left out! Thirsty instead? Krumpets can design your chosen beverage like hot chocolate or coffee to soothe your taste buds. Click on name for more info. Scroll to the end of the listing for Facebook & website. 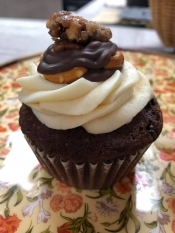 Cupcakes & muffins are our specialty and we also serve many flavors of coffee and tea. The shop also sells small gifts, like T-shirts and necklaces. Customers can also find special blends of lip balm, including chocolate peppermint, apple cider, and chai tea. Click on name for more details, scroll to end of listing for website & social media. 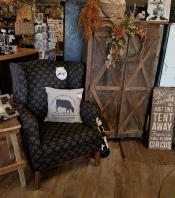 A full-service florist plus a very unique gift store offering a wide variety of candles, home decor items, gourmet foods, antiques, many new jewelry lines, and much more. 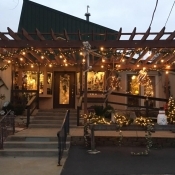 11,000 square feet of giftware, greenhouses, chocolate treats, gourmet food mixes and handbags. Like & follow us on Facebook for hours, events and promotions! Click on name for more details, Scroll to the end of the listing for website & social media info! Serving house-made pastries, desserts, bagels and bread baked fresh daily. Wines, espresso, specialty coffee & teas, cured meats, Wisconsin cheeses and more also available. Open daily 7am - 3pm. Lunch served 10:30 am – 2pm.